The ES21 is a sequencer designed for delivering pulsed or gated events, for rhythm and percussion, triggering other sequencers, or selecting stages in Programmers such as the ES23 & ES24. The main function of the board is as a sequential pulse generator. When clocked by an external source, each of its outputs will come on one after the other. This can be used to sequentially trigger up to ten events. 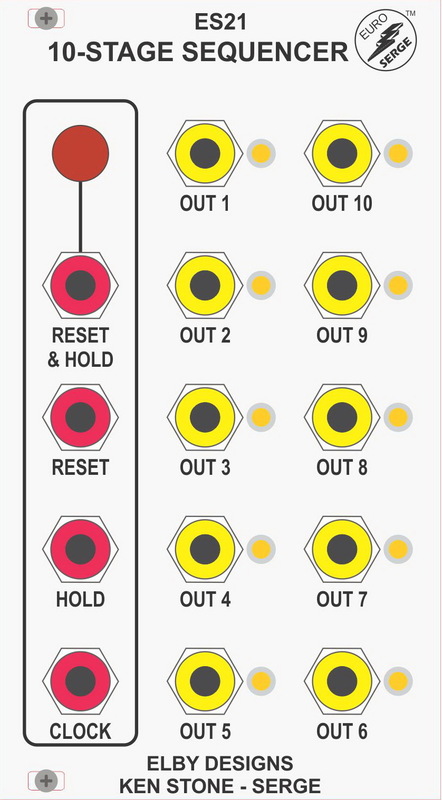 An example would be to set the number of steps to 2 by patching OUT 3 to RESET, then connect outputs 1 and 2 to two drum sound generators. A pulse train fed to the clock input would then produce a drum roll alternating between the two drum sounds. When coupled with the ES23 (and ES24) rhythms of up to ten steps can be created. Once you have a sequencer in your modular, you will wonder how you ever survived without it. the Serge design in several areas.